Our first trip into Shropshire and the Ironbridge gorge. 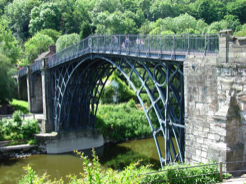 A lot of people take Ironbridge as the birth place for the industrial revolution, the gorge is full of rich natural resources that made the job both easier and cheaper for mass iron production. It was Abraham Darby that perfected the process of smelting iron and coke in Coalbrookdale, and It was his grandson that built the bridge that crosses the gorge. 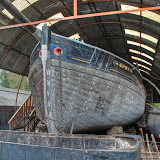 It was the first one ever constructed and from Cast Iron, It is 60 metres in length and it crossed the river severn. You can cross the bridge by foot and there is a nice pub nearby where we had a pint (as per normal) and had a look around the small town. There was heavy industry all along the gorge with Iron smelting, potteries, coke making and mining, the effluent made the river Severn very polluted. The first visit was to Bliss Hill Victorian Museum, this is without doubt the best one and shows you what life was like back in Victorian times. it was a birthday treat for me and a place we had wanted to visit for a few years. There are many museums in and around the gorge area and you can purchase a passport ticket that enables you upto 12 months to view them all, it cost £22 for an adult and for the amount you can see is not bad value for money. Inside the Victorian museum you will see many working examples of victorian life including Iron smelting, mining and other heavy industry. There are victorian shops that still sell things using Pre-decimal money, I must admit I didn't understand the penny half penny farthing whatsoever until it was explained to me, thank god we changed to a decimal currency. Inside the chemist you will find an old dentist chair that had a drill powered by foot, one can only imagine the fun and games somebody had sitting there whilst having a filling done! It was soon clear that life was very hard and the injuries and fatalities were a part of the working life. To look around takes about 3.5 hours. I have not detailed all the museums here they were good but this one was the best by far. A small walk from ironbridge takes you to the village of Coalbrookdale and the museum of iron, it was on this site that the first smelting of iron using coke instead of Charcoal was perfected. It was nice to see that the Aga cookers have their foundry and they are still made here to this day (Gail now wants one). You will see the old blast furnaces that Abraham Darby 1 used and again this museum was very interesting . Please click the photo below for the Pictures we took.